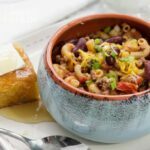 Chili Mac: a classic family favorite meal that's super easy! I make this Chili Mac for dinner often, but it’s also great served to friends when watching football! 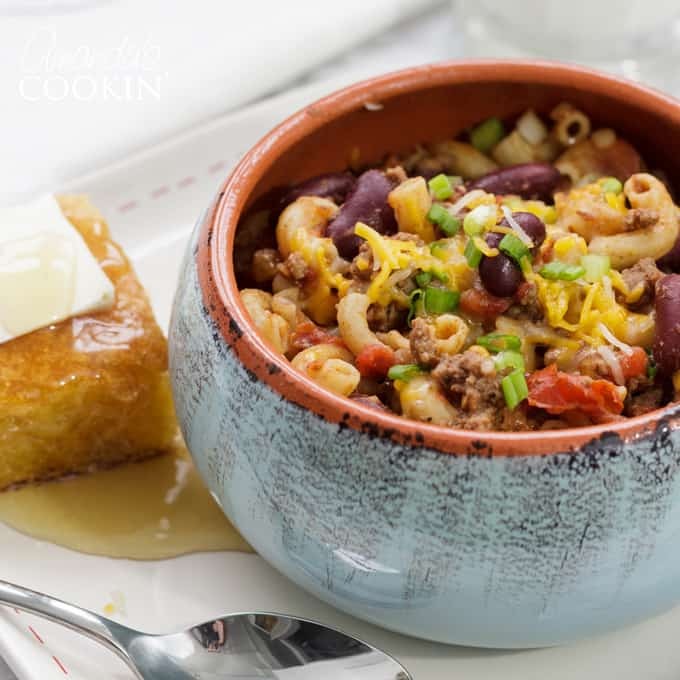 Use my homemade chili seasoning mix, your favorite elbow macaroni, and hearty ground beef (or turkey, chicken, etc) to make this delicious comfort food meal! 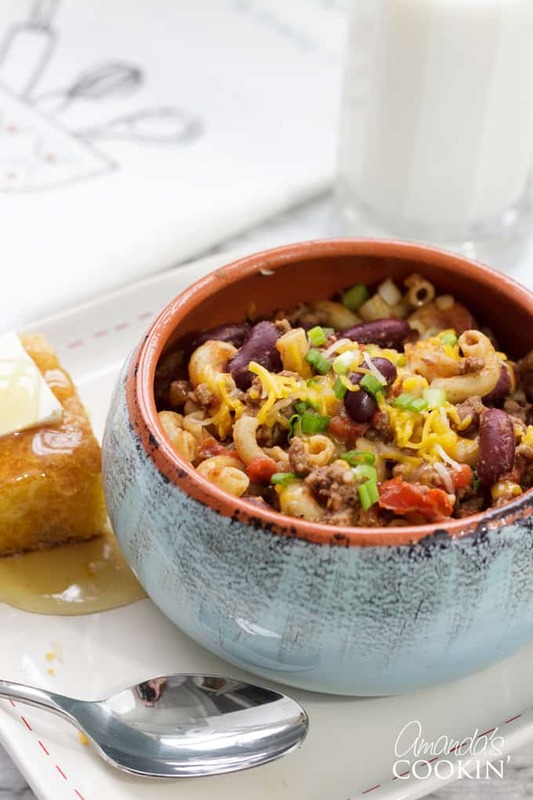 This chili mac recipe is one that my family loves, and truthfully I love it too. Why? Because it’s so fast and easy to make and it saves me time from running around trying to figure out what I’m going to make for dinner. I keep a big jar of my chili seasoning mix in the cabinet because we eat chili quite often around here. However you can certainly measure out the ingredients every time you want to make it, either way works! This is one of our favorite winter time meals. I often serve it with warm cornbread topped with a thin pat of butter and drizzled with honey. Yum! I would definitely recommend adding this to your must-make ground beef dinner ideas! For a little added color, especially if serving this to guests, sprinkle your chili mac with sliced green onions and shredded cheddar and mozzarella cheeses. 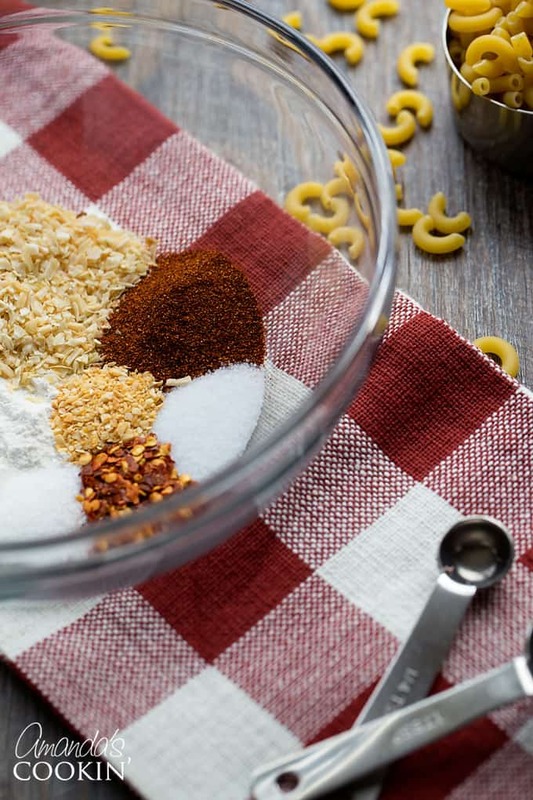 For the Chili Mac, mix together flour, dried minced onion, chili powder, salt, crushed red pepper, dried minced garlic, sugar and ground cumin. Brown ground beef in a skillet. 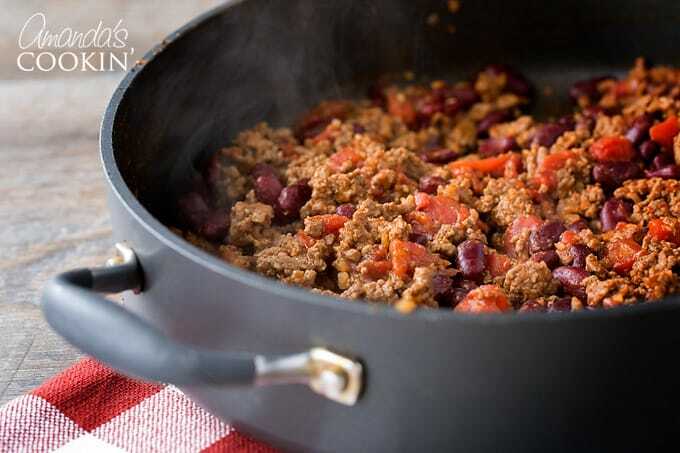 Drain off fat from ground beef and return beef to pan. Add seasoning mixture, water, beans and tomatoes and stir to combine. At this point, you can add in anything else that you want to personalize the recipe. Bring to a boil, reduce heat and simmer for 20 minutes, stirring occasionally. Prepare elbow macaroni per package directions. Drain and stir into chili. I love a good comfort food. 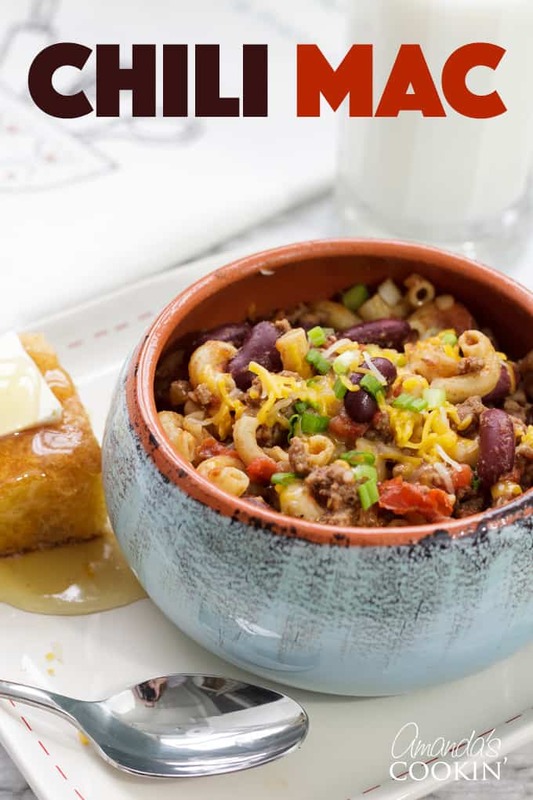 This Chili Mac recipe is definitely one of those! I hope you all enjoy! 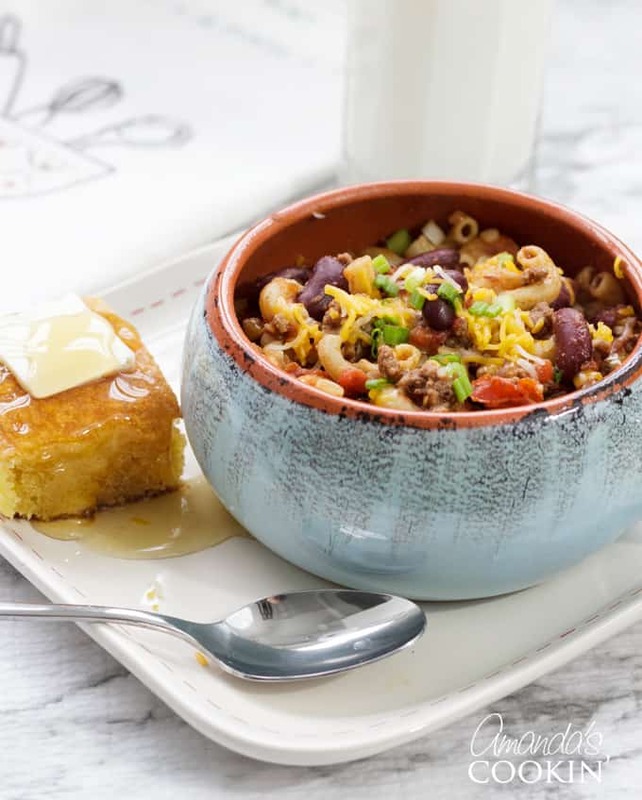 The noodles in this recipe pair perfectly with this 3 Bean Chili served up with some delicious Sweet Cornbread on the side! This post was originally published on this blog on Nov 18, 2011. 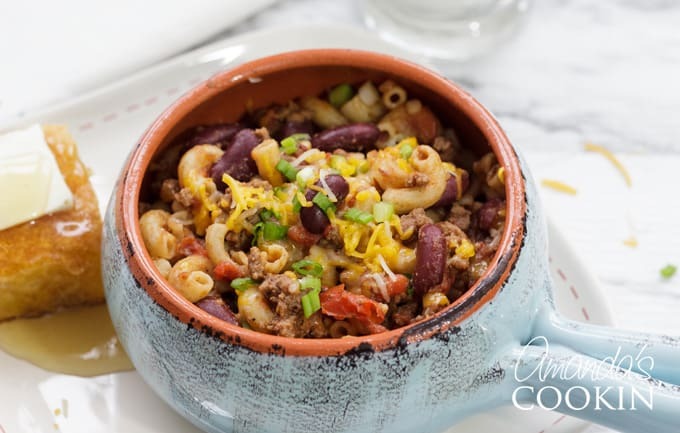 A hot, hearty bowl of chili mac is great for dinner or when friends come over to watch the game! Mix together flour, dried minced onion, chili powder, salt, crushed red pepper, dried minced garlic, sugar and ground cumin. Brown ground beef in a skillet. Drain off fat from ground beef and return beef to pan. Add seasoning mixture, water, beans and tomatoes and stir to combine. At this point you can add in anything else that you want to personalize the recipe. Bring to a boil, reduce heat and simmer for 20 minutes, stirring occasionally. Chili mac is such a genius combo. All the comfort and warmth of chili paired with the homestyle love of a pasta dish, + cheese. Cannot wait to try this! This looks so delicious! It’s like two of my favorites in one delicious dish. I would love the penne, I make a to die for lemon parm pasta!! Great giveaway, Happy Thanksgiving to all! I would take the elbows to make either chili mac or taco mac…. I love it! I would try elbow – and make some mac and cheese. thanks! I love Penne! I would make a greek Penne pasta, Yum! I would choose Penne Regate and I would make a dish using Italian sausage, green peppers, onions, Marinara Sauce and pasta. Very good. Would love the penne rigate so I could make my 5 cheese pasta sauce. Yum!!! Rotini has to be my favourite pasta, I love those little spirals. :) And I’ve been dying to make something nice and cheesy. The boyfriend has been promising to teach me how to make homemade macaroni and cheese! I would love to try the Rotini and I would make a lovely pesto to mix it with and some marinated and grilled chicken. I would try the elbows out on my Goulash! I would like to try the Penne Pasta with your recipe. It would be Wonderful. Iwould like to try the Rotini. . . I have a pasta salad recipe I want to try with fresh cucumbers and tomatoes. It would be lovely to win and thanks to you and Ronzoni for making this available. Happy Thanksgiving !!! I’d like to try the rotini pasta. I would use it to make my favorite stovetop macaroni and cheese. Thanks! I’m a big fan of penne cut pasta! That’s definitely what I’d try. I’ve actually seen a lot of good looking pasta recipes on Pinterest recently that I’d love to try, especially one creamy garlic chicken one. The chili mac sounds yummy, by the way! i tweeted about the recipe and giveaway! oooh, the penne rigate would be perfect in my baked penne with spinach and artichokes! thanks! Rotini with some quick marinara and dinner would be on the table in no time. Your chili mac would be great too. I would make elbow macaroni for a tuna & pasta salad. I would add black olives like my mom used to do. I would try the elbow macaroni in my stovetop mac n cheese! I would love to try the elbows to make with some Cincinnati Homemade Chili. Thank you for the giveaway – the pasta sounds terrific! I’m always looking for ways to save on time! I would make the Penne pasta with tomato sauce (I keep a stash frozen) add some sliced green olives, ground meat and garlic and top with salty pecorino. DELISH! I would want the elbow cut of pasta and would want to try the no bake Mac and cheese. I would like the rotini to make good old fashioned mac & cheese! I would use the Penne Rigate in a Pasta Salad. I would love to try the Elbows and make some Bacon & Blue Cheese Mac & Cheese – yum! I’d choose the elbow macaroni and try your Chili Mac recipe with it. The recipe sounds good and picture makes me know I need to try it. I JUST put our chili in the freezer this morning after two days of eating leftovers. I’ll definitely try this when we pull the leftovers out of the freezer. Rotini for a pasta salad with tomatoes, onions, black olives, red bell pepper, Parmigiano Reggiano, etc. Penne rigate. I’d cook penne with sauteed garlic, sundried tomatoes, and goat cheese. I would love to try the elbows and make our family’s traditional “pot cheese and noodles”. My grandmother used to make this comfort food and each generation has been learning how to make it. We sauté onions and add cottage cheese and serve warm…yum! Just tweeted about your giveaway, too! I’d definitely want to try the elbows. And, of course, I’d make a classic macaroni and cheese with them! I would like to try the rotini and make the cheeseburger mac and cheese. We love penne and the kids all prefer a tomato/spaghetti sauce, which I always make homemade. I love your spin on it with the chili! I’d get rotini… I love the shape of it! And I’d love to make a homemade version of the broccoli and cheese rotini I like that’s boxed and Velveeta makes it. That sounds fantastic. The elbows are needed in my house. Anything that convince the fiance that homemade mac and cheese is just as quick (and even tastier) than the box stuff wins in my book. I would have to go with the rotini as I love the spirals. As for what I would make with it…easy. I love baked pasta so load up on marinara, fresh vegetables, and parmesan cheese for a delicious baked pasta. I would love to sample the elbow to make with my bacon mac n cheese. We’re penne rigate fans. 3 minutes? Wow. I had no idea that even existed! We like any kind of pasta. But pasta ready in three minutes is awesome and will save me lots of time with mac and cheese and crock pot pasta dishes! YUM! I love making chili mac! If I won, I would want the Penne Rigate because it’s my favorite type of noodle. And something that cooks in 3 minutes?? Perfect for a Theatre Ed and History Ed Major (DOUBLE!) who loves to cook but doesn’t have all the time in the world! I would like the Rotini, and would use it for chili mac or spaghetti. I love how the rotini holds the sauce! Penne rigate sounds pretty great. I’ve been craving chili mac, I’d go with that! I actually copied the recipe you gave on this post before reading the contest rules. My pick would be the elbow macaroini. Anxious to try out this recipe. I would love to try the Penne Rigate, and I think I would try your Chili Mac! I would want to elbow pasta to make my Buffalo Chicken Mac n Cheese. YUM!! It would have to be Rotini with my homemade Bolognese sauce, my daughter’s favorite. I would choose the penne regate if I won.